France 17-28.5.1995, Paris Cannes Film Festival. Original Hans Erdmann score reconstructed for full orchestra by Gillian Anderson. Italy 25.6.1995, Bologna Il Cinema Ritrovato. Score as above. UK 19.11.1995, London Film Festival, National Film Theatre. Score as above. In 1995 Enno Patalas overhauled his earlier 1987 restoration completely, this time using a recently discovered original French print as the basis and retaining only the 1987’s intertitles. Patalas used the recreated original German intertitles, made by Studio Pfenninger in 1981, for all four of his restorations up to and including 1995. They were based on those in a copy of an original German print, as were the intertitles of Berriatúa’s 2006 restoration. Therefore, both sets of intertitles are accurately represented by the 1995 and 2006 examples below. 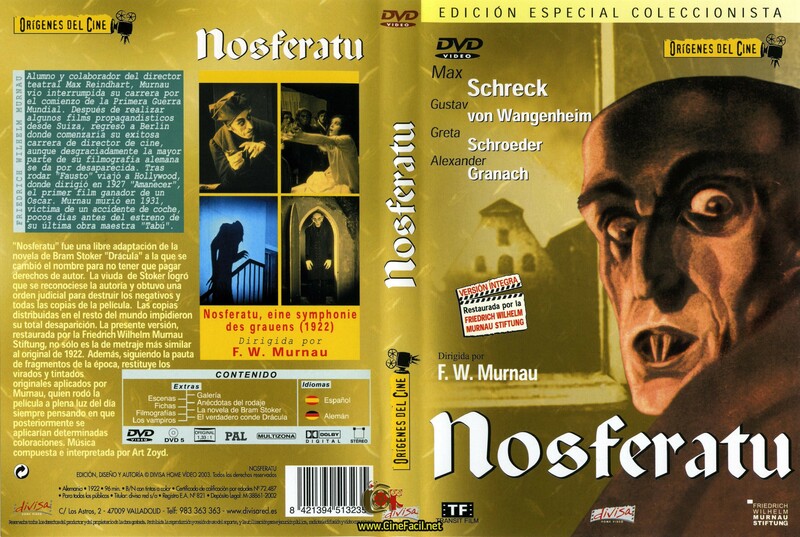 The 1995 restoration appears numerous times on home video but its original German intertitles only appear on three Spanish and German releases. While two are on VHS, the sole DVD‘s Spanish language option consists of translated intertitles that use the subtitle stream to cover the originals completely. It’s an unusual technique and the only other examples I’ve come across are several DVDs of Pandora’s Box (Die Büchse der Pandora, 1929). Do post in the comments if you know of any more! UK 17.11.1997, London Royal Festival Hall. New orchestral score by James Bernard. UK 1997, broadcast on Channel 4 as that year’s entry in the Channel 4 Silents series. Score as above. David Gill (1928–1997), Kevin Brownlow and Patrick Stanbury of Photoplay Productions added new translated English intertitles to the 1995 restoration and a new orchestral score. This version was then broadcast in 1997 on Channel 4 and is the one featured on the BFI’s DVD and BD. The Photoplay version is unique among restored iterations of the film, in that it dispenses with the five-act intertitles altogether and is transferred at 19fps; all other versions retain the acts and run at 18fps. The very high quality intertitles replacing the remainder were created on film. Kevin and Patrick say they believe very strongly in replacing foreign language intertitles for domestic markets, as happened during the silent era. (Subtitling didn’t become commonplace until the 1930s.) They went to a great deal of effort and expense to have the original German font replicated in English; where necessary having missing characters newly designed as carefully as possible. They then ensured their intertitles were exactly the same length, frame-for-frame, as the originals. I can’t argue with the results: they’re by far the best such modern recreations I’ve seen. Meanwhile, for their 2002 DVD, Kino in the US opted for a new set of translated English intertitles created on SD video. Première unknown (get in touch if you know!). All home video releases feature the original Hans Erdmann score reconstructed for full orchestra by Berndt Heller. In 2005/2006 a completely new, digital, restoration was supervised by film historian and preservationist Luciano Berriatúa for the Friedrich-Wilhelm-Murnau-Stiftung (FWMS), again in conjunction with various archives. Except for the BFI BD, this version is the one featured on all BDs and DVDs from 2007 onwards. You can see a fascinating side-by-side, before and after comparison of the entire 2006 restoration here. It clearly shows the sometimes shocking state even some of the best surviving materials are in and just what an incredible job restorers really do. This restoration was based on the 1922 tinted French print at the Cinémathèque Française. Missing scenes were taken from the Bundesarchiv’s early 1940s B&W safety copy of a 1920s Czech export print and a print of Die zwölfte Stunde at the Cinémathèque Française. Intertitles were digitally scanned directly from those in the Bundesarchiv’s B&W 1962 safety copy of the original 1922 German version and restored in high definition (HD). Missing ones were recreated using the same technique and have FWMS in the lower left corner. Additionally, new English-translated intertitles, in a fairly similar style to the originals, were prepared for some countries’ BD and DVD releases. The idea that a part of Nosferatu is our own dark desires manifested is a driving force within this music. It is constantly searching, yearning for something which it cannot find. In the 1995, Hutter is looking out of a window at Orlok loading a cart when a one-second-long shot of him appears too early. There’s a cutaway to Orlok then back to Hutter, where said second repeats, this time in its correct place, before running as intended. On the BFI BD it’s at 0:37:48. The 2006 actually manages to invert a brief shot of Slovakian Jánošíkove diery (Janosik holes), which are usually incorrectly referred to as a waterfall. In the shot, the water is clearly running upside down! On the Eureka BD it’s at 0:35:24. The 2006 has a second editing error which is similar to the one afflicting the 1995. In a long shot of the town crier walking down the street, there is a jump and the image repeats itself momentarily. On the Eureka BD it’s at 1:16:24. In early 2016 Patrick revisited Photoplay’s version to perform some additional clean-up. As a result of this article, he also fixed the editing error! The improved version is now being used for their DCP and will replace the version currently on the BFI BD and DVD, should they ever be reissued. Greta Schröder not enjoying her day at the beach. UK BFI Blu-ray. The tinting varies greatly between the 1995 and 2006 restorations and some minor flubs were fixed by the latter. For instance, in the 1995, Hutter’s darkened hotel room is already tinted in an amber shade, indicating indoor light, seconds before the innkeeper’s wife enters bearing a lit candle. Later on this happens in reverse: the wind from an open window blows a candle out and there’s delay before the roomgoes dark. In the first instance, in the 2006, the room is initially tinted in green, denoting darkness, before changing to amber at the correct moment. Conversely, elswhere the 2006 reintroduces old mistakes or makes new ones. In both versions there are several baffling, as well as annoying, choices made that defy all logic. Additionally, all pre-2013 DVDs featuring each restoration differ from the colours of their BD counterparts. “Your wife has a beautiful neck…” Max Schreck (L) and Gustav von Wangenheim. UK Eureka-Masters of Cinema Blu-ray. “The tints differ for three reasons: 1) Different conclusions made by Patalas and Berriatúa regarding the original tints, 2) the choice between keeping to the original (but illogical) tints in one scene or correcting it, and 3) different methods of applying the tints to the final prints and digital versions. 1) The tinted original 1922 French release print, used for reference, has all its different colours varying in hue. Patalas made the assumption that the colour for night-time, varying from blue to an almost blue-green, was supposed to be two different colours; blue for night exteriors and green for unlit night interiors. Berriatúa concluded that the variations in hues were merely due to the printing and dye tinting techniques used, and that there was only supposed to be one hue of each colour. Hence night exteriors and unlit interiors were all supposed to be the same, namely greenish blue. 2) In the tinted French print, the section where Hutter leaves the inn and travels into the mountains does not really make sense regarding the tints. Hutter leaves the inn at dawn (pink, normally used for dusk and dawn), travels into the mountains at dawn (pink), remarks that the sun is setting (whereafter the film changes to yellow, normally used for daylight!) and arrives at the castle at night (greenish blue). Patalas saw this as an error in the French print and chose to correct it in the 1995 restoration: Hutter leaves the inn during daytime (yellow), remarks that the sun is setting (change to pink) and arrives at the castle during night (blue, as per Patalas’ conclusion about night-time exteriors). For his 2006 restoration, Berriatúa agrees that the original tinting is illogical but chose to leave it as was, since it could not be determined for certain that there was an error in the print. “He’s creepy and he’s kooky…” Max Schreck as Count Orlok, up to no good as usual. UK Eureka-Masters of Cinema Blu-ray.